While the whole world waits for Vladimir Putin to heed President Obama's urgings to pull his troops back from the Ukrainian border, management has requested that this week's column ignore the possibility of a foreign policy disaster and write one that features innocuous items and so it came to pass that the World's Laziest Journalist was awarded a one day all expenses paid excursion to San Francisco to gather material and do some fact checking. We haven't heard conservative talk show host Michael Savage for quite awhile but he used to be terrified that San Francisco values would metaphorically do to America's collective code of ethics what the black plague did for Europe's population of peons a few centuries back. With the proliferation of gay marriages and the growing success of the legalize pot movement, he must be much more frantic these days. We thought a walkabout look at his hometown might be fun. 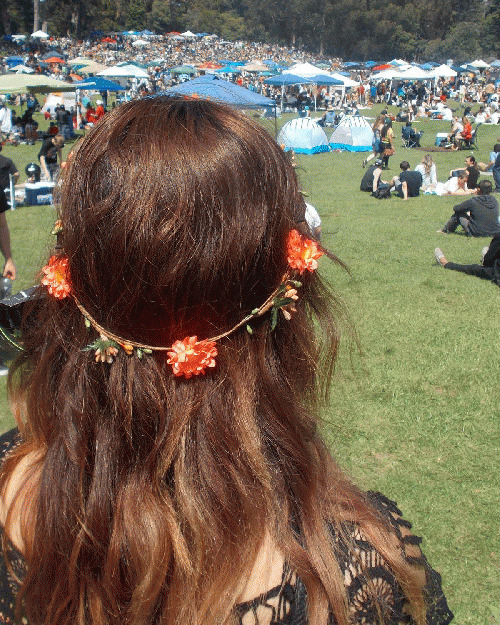 Last Sunday, the advocates of legalized marijuana gathered around Hippie Hill in Golden Gate Park and expressed their view on the topic by committing the infraction of smoking pot. Fifty years ago when the Jefferson Airplane, the Hair soundtrack album, and Santana were all the rage, pot was a hot topic. Some folks thought that life in prison for one joint in Texas was excessive and that using Agent Orange wasn't. We headed right for the North Beach area that was home to the beatniks and hippies. We squeezed into the Space Between art gallery and learned from artist Chris Farris that a local political dispute was going global. A petition critical of efforts to put a fence around Huntington Park (Google hint: Huntington Park fence petition) has drawn responses from around the world. The board of Supervisors has indicated that only local registered voters should be counted as valid signatures, but the petition posse maintains that in a city that is saturated with tourist attractions and visitors from far far away, the opinion of someone living in Ulan Bator (formely Urga) should also count. Speaking of going global it seems that Smart Car tipping (the urban equivalent of cow tipping? ), which got started in San Francisco, is showing up elsewhere and is rapidly becoming a trendy world wide prank. While walking from the Little Italy section towards Fisherman's Wharf, we noticed La Rocca's Corner bar, which promotes itself as the "Home of Rugby in San Francisco." We ducked in and, knowing that restrooms are always for "customers only," inquired if someone who knows who the All Blacks (New Zealand's highly regarded rugby team) are could use the rest room. The bar tender said "sure!" Since he had a great radio voice we decided to linger and buy a glass of ginger ale and chat. We asked if locals, such as the barkeep and the owner, objected to "Frisco" as the slang term for Fog City and were informed that during WWII many soldiers (such as the owner's father) from San Francisco were assigned the nickname "Frisco." They shrugged their shoulders and said "We don't care." They added that the only person who objected to the sobriquet was Herb Caen who was from Sacramento. They added a vulgar assessment of the man who claimed the title of "Mr. San Francisco." It is our understanding that Caen recanted and sanctioned the moniker very late in his life. We saw what is allegedly the world's only steam powered motor cycle at the Musee Mecanique. As we headed back to the BART for transportation back to Berkeley, we encountered a group of adults in pirate attire. They were playing a game (at noontime on a regular working day) and while we were urging them to read our online columns to impress our editor with our popularity, they spotted Batman and went running after him like (dare I say it?) bats out of hell. We had not gone a block further when we encountered a pack of cats playing the same game. If San Francisco is going to become a bellwether for the USA, perhaps we will have to do some future columns that examine the wider implications of the fact that voter subsidies for professional sports team owners may have met their Waterloo at San Francisco's recent Embarcadero arena fiasco. The San Francisco and Oakland football, basketball, and baseball teams are playing cities off against each other in an effort to get the biggest and best deals from their hometown. If San Francisco can't come up with new economic advantages and incentives, well then maybe San Jose can. As long as the teams stay where they are, the wheeling and dealing doesn't matter to team fans and the political wonks have enough on their plates already and don't have the time to read up on the political backroom strategies needed by anxious politicians who want the sports fans who are registered voters to stay content. Rent affects all Golden State tenants and San Francisco's battles over the Ellis Act might change the game completely. Hence it makes sense for groups such as the Marina (del Rey) Tenants Association to read up on and be well informed about the changes to the Ellis Act that are being urged by San Francisco landlords. The mid term elections are a bit more than six months away and the Presidential election is about two and a half years down the road. Long and intricate assessments of the local stories can not be used for the entire intervening time frame at a time when skim reading is gaining popularity. Run more than one extended analysis of the problem and it is very likely the regular readers will become bored and restless.